A joint collaboration between Seadog Sport, Plastics|SA and DPI Plastics has led to the creation of a new retrieval project aimed at reducing the amount of plastics sticks and straws found on the beaches of South Africa. “We’ve had great success with removing discarded fishing line from beaches with our Fishing Line Bins which are made from PVC pipes donated by DPI Plastics. 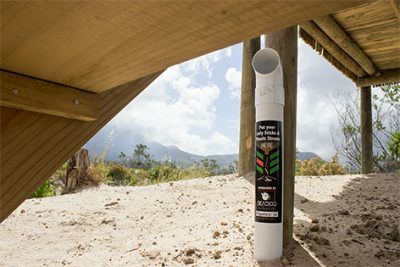 These bins were installed at beaches along South Africa’s coastline and encourage anglers to properly discard their fishing line instead of leaving it on the beach where it could entangle birds and sea life. Building on the success of this project, close to 400 ‘lolly bins’ (made from PVC pipe off-cuts that were again donated by DPI Plastics) are being installed at selected Blue Flag beaches as well as other coastal areas throughout South Africa,” Kieser says. The white lolly bins are easily visible and the black and brightly coloured labels highlight their usage. According to Kieser, members of the public are urged to help pick up any of these sticks they see lying on the beaches and throw them into the bins. “These sticks are made from High Density Polyethylene (HDPE) and Polypropylene (PP), polymers which are both recycled in South Africa. If enough of these sticks are collected, they can be used to create a wide range of different products, such as non-food grade packaging, rope, toys, piping, recycling bins and other household items,” he explains. “Seadog Sport is a company with community interests close to our heart, and we work closely with charities and organisations to improve lives through surfing rehabilitation and marine conservation activities. Reducing plastic waste on our beaches and in oceans is a major focus for us and we are excited about collaborating with Plastics|SA and other partners on this project which offers a very practical solution to a growing problem,” says Simon Brooker, co-founder of Seadog Sport. “This collaboration represents another step towards helping in the conservation and safety of our marine and coastal life, which goes hand in hand with cleaner beaches. If the material can be collected on a large scale, it can be recycled instead of ending on a landfill and in the environment as at present,” he says.